Vincent Van Gogh was a brilliant artist, who wasn’t acknowledged until his death at age 37 on July 27, 1890 from a gunshot wound in the chest. He would be known for his exceptional work. Whether it’s the boldness of the blue and white swirls in the painting ‘Starry Night’, the arrangement of beautiful sunflowers to his countless self-portraits. He struggled with himself and with others. It seemed the only person willing to put up with his nonsense was the equally talented French painter Paul Gauguin. In 1888, Van Gogh invited Gauguin to spend some time in Arles, France to paint and talk about art. From the moment Gauguin arrived, he was ready to go. It’s a boys’ night out as art biggest names, Paul Gauguin (Bryan Bellomo), Georges Seurat (Joel Scher), Henri de Toulouse-Lautrec (Laura Nicole Harrison) and Auguste Rodin (Krystyn Evelyn). 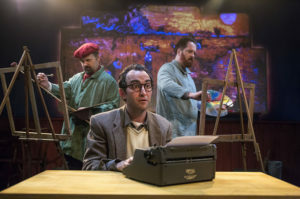 As the men trash talk to each other and about one another, their favorite topic comes up and they really slay on the absence Vincent Van Gogh (playwright Brendan Hunt does a remarkable job as the troubled Dutch painter.) As the men play and damn Van Gogh in the process, the man himself comes in all disheveled and looking like a tired mess. The last anyone has heard from the “suicidal Dutch man” was that he left to go to an artist colony in Arles, a remote place in France. Serrat proudly shows his latest creation “A Sunday Afternoon on the Island of La Grande Jatte.” Van Gogh prophesied that the picture will be thought about because it contains a lot of dots. Fast-forward 81 years, the story moves ahead to playwright Neil Simon (Clayton Farris) writing his latest opus, “The Odd Couple” in a small dark club. He’s trying to stray from writing about his family, again, and tries something new. The wife and kids are away at the Catskills and Simon keeps company with waiter/busboy Sam Rogers (Ryan Welsh). Rogers gives his advice to the future Tony-but, takes it, because Sam knows what he’s talking about. Instead of Felix Unger arguing with Oscar Madison, it’s Van Gogh and Gauguin having an argument. Simon briefly considers that. After a long conversation, Simon realizes that the muscle-bound Rogers knows what he’s talking about and takes careful notes. Before he realizes it, Steve becomes a co-writer. This is not what the Bronx-native had in mind. Meanwhile, back at the colony in France, when, Gaugin arrives, both men decide to paint their individual portrait. By the time, the French painter finishes his spiel about how lengthy the process is in doing a portrait, Van Gogh is done in about an hour. Gaugin both admires and despises his colleague’s work. Hunt does an excellent job in both acting and writing. Director Lauren Van Kurin does a fluid job in keeping the stories separate but cohesive. There aren’t any gaps that may lead to questions. That is excellence in her talented part. The ending is rewarding and unexpected, but, pleasing. Well thought out. Smartly written. Excellent direction. Enough said.